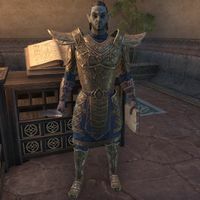 Traylan Omoril is a Dunmer who can be found at the Hall of Justice in Vivec City along with his sister, Beleru Omoril. He is the Ordinator responsible for giving out daily Delve quests. "Many come to us for aid, and the Temple cannot turn them away. That is why we look for outside help." "Major events overshadow the lesser, but even small troubles can be of great importance. Do you wish to help?" "Though I am loathe to admit it, our resources are stretched during these troubling times. Are you in need of work?" "The Temple cannot spare the resources to handle every problem that comes our way. But perhaps you can." I'd like to help with any work you have available. "Powerful Daedra have been sighted roaming the wilds near the Sunken Vaults of Ashalmawia. It leaves little doubt that the servants of Molag Bal have returned to his ancient shrine to continue doing his dark works. This can't be allowed to continue." "Savile Alam's reports speak of numerous rituals being performed by the Worm Cult to summon these Daedra. We must put a stop to them once and for all. I would seek out Savile before you attempt to do so. She may not have departed Vivec yet." I'll put an end to the Daedra summoning. "The kwama miners of Matus-Akin have developed a dangerous breeding method which produces highly aggressive kwama. While their methods are questionable, we would still like to know more. What they've developed may ultimately turn out to be profitable." "Confiscate an egg from the primary egg chamber and find some breeding research describing their methods. You'll also need to plant poison kwama feed that will help control the mine's population. You may speak with Kylia Thando for more information." "Bandits are occupying a cave called Zainsipilu. They're under the delusion that they have access to a monopoly of moon-sugar grasses, a plant that isn't able to naturally grow here in Vvardenfell. We'd like to keep them preoccupied." "Misinformation. Take these two notes regarding moon-sugar's growth process. Leave one near their crop and one near their research. Deal with the bandits however you like. Evos is nearby if you need more information. He'll also have your reward." "Tax collectors are occasionally robbed making their rounds, but until recently the assessment offices were rarely targeted. There has been a rash of heists where thieves made off with both the gold and, strangely, the tax records as well." "Alves Droth, the functionary investigating these thefts, believes the thieves have established themselves in Pulk. Go retrieve the stolen taxes and records. This city needs those monies. Alves can be found here in Vivec, if you need more to go on." I'll retrieve your stolen taxes from Pulk. "This one is personal, Outlander, so listen up. I've recently been making some headway with the Zainab Tribe of Ashlanders. They're more amenable than most of their kind, so I try to send them aid when possible. That's where you come in." "I need you to collect Dwemer parts and tools from the ruins of Nchuleft. The Zainab tribe used to loot it for items to trade. Dredase-Hlarar can tell you more. Give the items to him once you're done." "We believe the Camonna Tong are smuggling slaves in a cavern called Khartag Point. If true, we have the opportunity to prevent them from gaining foothold in the region. However, the Temple must have confirmation before we can act." "Search the Camonna Tong campsite in Khartag Point and eliminate their commander. That should slow their progress. Vorar Vendu has brought this issue to our attention. He's in Vivec City if you need more information. He'll also have your reward." "Our request often require an amount of finesse. Remember, you represent the Temple as you set forth on this task." "Your services to the Temple will not be forgotten. At least, as soon as you actually complete your task. I can't really make any promises until that happens." "Alas, I have nothing else to tell you on this matter. Speak with the one who made the request." "You're [sic] payment will be given by the one who made the request. We often find a quickly completed task is met with generosity." "Ah, now that I think of it, I do have something else to tell you. Quick feet make for strong spirits. I believe that's self explanatory." "You've done excellent work today. Rest. Reflect. There will be more battles to fight on the morrow." "Your compassion is your strength. To aid others is to enrich the spirit. Thank you for all that you've done." "Your generosity has been well noted, but I have no other task for you at this time. Give the Temple time to find another." "You have helped us in all our current endeavors. Come back later and we should have more requests." "Never have I seen such competence when helping others. The Temple will keep you in mind when we next receive a request." This page was last modified on 18 February 2019, at 15:46.